Back in July 2011, Randy Seaver posted a “Saturday Night Genealogy Fun” (SNGF) challenge to create a “Where I’m From” poem using the template at this site. I started a post then but never completed it, and I stumbled upon the draft on my laptop the other day. Now Randy has posted the challenge again tonight! This time I decided to let my creativity out and came up with this little ditty about Where I’m From. We all have a story – where are You from? I am from home-cooked meals, from chicken soup and Tastykakes. I am from the city of brotherly love, rooting for the Fightin’ Phils and the Broad Street Bullies, from playing wiffle ball in the street and riding bikes down Kirby Drive. I am from sweltering humid summers, occasional blizzards in cold winters, from honeysuckle and buzzing cicadas. 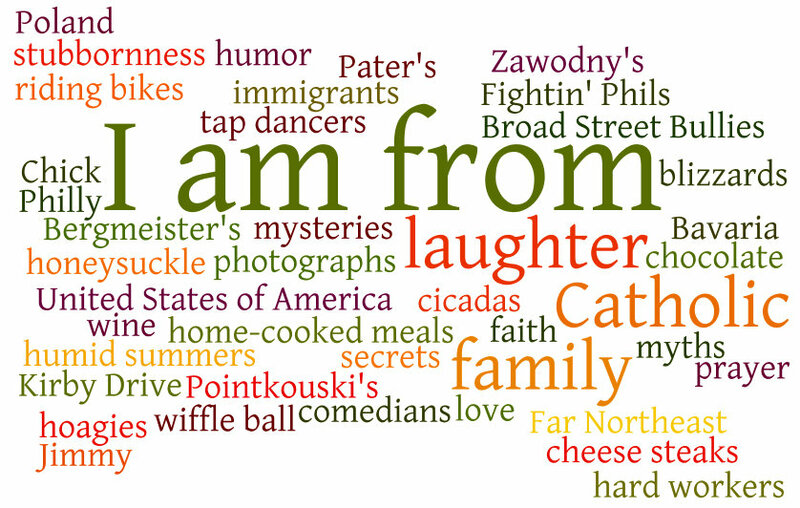 I am from laughter and stubbornness, from Jimmy and Chick, from Pointkouski’s and Bergmeister’s and Pater’s and Zawodny’s. I am from factory workers and truck drivers, from part-time tap dancers and comedians, from hard workers earning a living but never doing what their hearts wanted to do most. I am from using every pot to cook a meal and never going out with wet hair. I am from Catholic school, from believing in the Real Presence and knowing good priests and fun nuns. I am from the rosary and down in adoration falling and holding hands to pray around the kitchen table. I am from the Far Northeast in Philly, from Poles and Bavarians, from pledging allegiance to the flag of the United States of America. I am from cheese steaks and hoagies, from chocolate and wine. I am from the stowaway with the secret name, or maybe not, and from the baker called Sepp, and from the made-up surname that no one can spell. I am from mysteries and myths, from faces in too few black and white photographs, from immigrants who left the only homes they knew to create a new one far away. I am from a family that didn’t hand down heirlooms but instead I inherited humor, love, and faith. I missed Randy Seaver’s SNGF (Saturday Night Genealogical Fun) this weekend, but it’s been so long since I’ve posted here I decided to turn his SNGF challenge to List Your Matrilineal Line into “Matrilineal Monday”. 3) Does this list spur you to find distant cousins that might share one of your matrilineal lines? My maternal grandfather’s side (Henry Pater 1912-1975) represents the shortest branch of my family tree. I can name his mother, Elżbieta Müller (Elizabeth Miller), but since I have not yet found evidence of her birth I can only provide the possible name of her mother based on secondary evidence: Alzbeta Smetanna (Elżbieta in Polish, Elizabeth in English). My paternal grandfather’s (James Pointkouski 1910-1980) matrilineal line is equally short. I can name his mother: Rozalia Kieswetter (08 Aug 1866, Mała Wies, Przybyszew, Poland – 10 Feb 1937, Philadelphia, PA) married Jan Piątkowski. Rozalia’s mother was Marianna Ostał (unknown, Poland – died after 1900 in Warsaw, Poland) married Jan Kiziewieter . For now, that’s the farthest I’ve gotten on these lines. The person on my tree whose matrilineal line goes back the farthest is my 2nd great-grandfather, Karl Echerer (31 May 1846, Pfaffenhofen a.d. Ilm, Bavaria – died after 1882, Pfaffenhofen a.d. Ilm, Bavaria). He is my paternal grandmother’s mother’s father. I can trace his matrilineal line back six generations in Bavaria to the 1600’s. I have not had any DNA testing done, mtDNA or otherwise, so I have no idea what Haplogroup I’m in – nor, for that matter, what it would tell me. I will have to investigate further unless someone wants to provide some insight in the comments. Does this list spur me to find distant cousins that might share one of my matrilineal lines? Actually, it spurs me to get back to my research – especially on my two grandfather’s maternal lines which are much shorter branches on the family tree than my own maternal line! But that poses an interesting question – are there actually any distant cousins that share these lines? I don’t think so. My Pointkouski grandfather’s sister did not have any children, to the best of my knowledge. I know his mother had at least one brother, but his descendants would not share the matrilineal line and I have not yet discovered a sister. My Pater grandfather had only brothers, so their descendants do not have the same matrilineal line. But did my great-grandmother Müller/Miller have any sisters? I wish I knew! It is time for more research! I was born on a Wednesday. I found this out when my parents told me! 1775 – Thomas Paine’s “African Slavery in America,” the first article in the American colonies calling for the emancipation of slaves and the abolition of slavery, is published. 1917 – International Women’s Day protests in St. Petersburg contributed to the February Revolution and ultimately led to the abdication of Tsar Nicholas II, ending the Romanov dynasty in Russia. 1983 – President Ronald Reagan calls the Soviet Union an “evil empire”. Wednesday, March 8, 1967 was an ordinary day in the lives of many people. No major headlines graced the front page of the New York Times, no scientific breakthroughs were made, and no events of great historical importance took place. Despite the mundaneness of the day, it was one of great significance to my family and me; it was the day of my birth. However, the world only celebrates one’s birthday if he is very famous, so the world continued its life as I began mine, neither of us concerned with the other. Looking back on that day, there were many interesting occurrences besides my birth. The pages of the New York Times were filled with news about Vietnam. The North Vietmanese attacked an American zone for the second time in a week. Senator Robert F. Kennedy suggested that, in order to see if North Vietnam was sincere about wanting to negotiate, the United States should end bomb raids. In the United States, Washington, D.C. seemed far removed from the Vietnam crisis. The big problem there was a dispute over where to house diplomats in the city. Those uninterested in that quarrel may have fancied the rumor that Press Secretary Henry Cabot Lodge might resign. People all over the U.S. may have been happy to see that Jimmy Hoffa was finally put into prison after ten years of escaping the sentence. Besides all of these headlines, Roman Catholics of the world were told by the Vatican that only sacred music was permitted for use in Church. Because I grew up alien to the pre-Vatican II days, it was interesting to see the Church still receiving the impact of Vatican II at the time of my birth. Two stories particularly resembled issues of today. One concerned abortion, an issue on which people take sides today. But in 1967 there was no question – abortion was illegal unless the mother’s life was endangered. The New York State legislature rejected a bill that would make the law more lenient. Because of the 15 to 3 vote, the state was criticized as trying to “abort abortion”. The second familiar issue was nuclear disarmament. The U.S. and Russia proposed a treaty to ban the spread of nuclear weapons, but India felt it discriminated against non-nuclear countries. India also wanted joint action against the proposal. In a modern world that is still trying to achieve disarmament, it is evident that the treaty never came to life. Another fascinating section of the paper was the entertainment section. Because faithful viewers protested the cancellation of Gunsmoke, it was returned to the air. The TV listings for the prime time hours of the major networks resembled the daytime schedules of independent stations today. Popular shows were Lost in Space, Batman, Green Acres, Gomer Pyle, Perry Mason, and The Beverly Hillbillies. Today’s hit, The Cosby Show, was far from Bill Cosby’s mind as he enjoyed fame with I Spy. One facet of 1967 television was exactly the same as today – the soap operas. Some were General Hospital, Days of Our Lives, and Guiding Light, all of which can be seen today. Coke is another part of our culture that is still around today, and it was in the headlines in 1967 as in recent months. There wasn’t any talk of “New Coke,” “Old Coke,” or “Coke Classic” though. The news concerned the price, which was scheduled to go up from 10 cents to 15 cents a bottle. If Coke’s price doesn’t best reflect the economy, the price of gold does – a mere $35 an ounce. As anyone can see, the world of 1967 is both different and similar to the world of 1986. Many changes have occurred in the past 19 years, although not all of the changes were good. The world still has little concern for me, as on that cold day in March, and at times I have little concern for it. We’ve both grown a lot, but I can’t say if we’ve both “grown up.” I’m glad I did. Why, oh why didn’t someone give that newborn baby her weight in gold? My Grandpop, James Pointkouski, was born on July 6, 1910 and would be 100 right now if he were alive. Therefore, my “roulette number” is 25. My ahnentafel #25 is my mother’s father’s father’s mother: my great-great grandmother Antonina Rozalia Pluta Pater (born 11 June 1863, Mszczonów, Poland; died 12 December 1938, Philadelphia, PA, USA). Antonina was my only 2nd great-grandmother to immigrate to the U.S., which meant my grandfather, Henry Pater, was my only grandparent that knew his grandmother (he was 26 when she died). Antonina was also the only mother-in-law to any of my “greats” that lived in the same country as the couple. Rumor has it that she did not get along with her daughter-in-law Elizabeth Miller Pater (my great-grandmother). Antonina died two weeks before my mother’s 3rd birthday. One of my mother’s earliest memories is attending her great-grandmother’s wake. Her father made her kiss Antonina “good-bye”, which probably explains why my mother isn’t very fond of wakes or funerals to this day.